It's that manic last few days of term...really?...already?...how can that be? Did I sneeze and miss a year? I've been sneezing an awful lot recently, along with lots of other people I'm sure. Once again I find myself in need of some crafty teacher gifts, both the girls teachers have been amazing, they have settled them both in seamlessly and I want to thank them because as you can imagine I'm so grateful to them all. I spotted a while ago some lovely jars that the lady had wrapped in little quilts oh they where adorable, I can't find the post. I do remember that the lady had either designed or put together some lovely fabrics and she had made the jar wraps to show them off, she had made a whole range of kitcheny goodies. I believe it was called bake sale? any way if anyone knows the blog can you let me know so that I can link it. 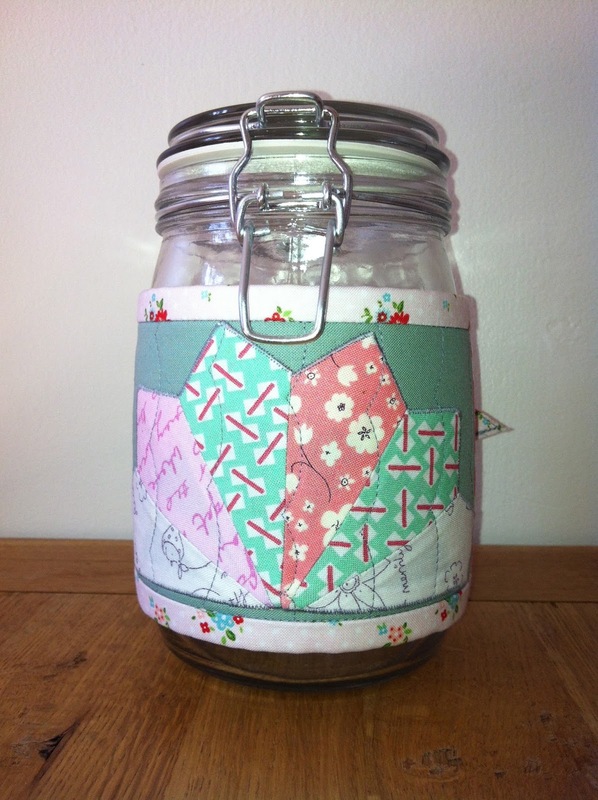 I love these jars, I've filled them with sweets. I can see them making lovely Christmas gifts too, in fact I've seen the big candle jars wrapped in them too, how lovely. Enjoy the last few days of peace and I hope it's not too hectic for you all.